I am an electronics engineer and I live in Mumbai. Atleast I used to, until I shifted to Pune, but since my parents live there, I visit Mumbai very often. Of the major cities I have been to - Mumbai, Delhi, Bengaluru, Chennai, Pune - I find Pune's climate among the most pleasant of them all. Bengaluru's would have been comparable had it not been for the pollution. Mumbai (and Chennai's) humidity levels are always unbearable to humans as well as machines. No matter how well you design a machine, it will always die out a lot earlier in Mumbai as compared to its exact same counterpart put to use in a dry city like Pune. No wonder cars used in Mumbai have a lesser resale value - who wants a second hand car which has been tortured by humidity for many years! A system of parts working together in a machine; a piece of machinery. I am referring to the second one. Biochemistry and Genetic Engineering are full of amazing mechanisms or life processes. The good thing about these fields are that they are pretty neat and tidy. They are one of the newer fields as compared to electronics, mechanical and other kinds of engineering. Being new, by the time revolution took place in these fields, scientific processes, tools and attitudes were already well developed. The result of this was that these fields have very little flotsam and jetsam of initial unorganized forays into them. For example consider the signs of electrical charge and the direction of flow of current. It was thought that the current was formed of positive particles and so the direction of positive current was the direction of these charges. Later when it was found out that current was formed of negatively charged electrons, we refused to change the convention - retaining time bombs of confusion which would blast every individual of successive generations to come atleast once. There are many such examples - like when the actual values of universal constants like speed of light was measured exactly, we should have been wise and designed a new system of units in which atleast one of the important constant was a whole number. I still hope that a day would come when we would grow 16 fingers instead of just 10 to allow us to interact with/program computers better and easier. But I deviate from the topic. So why is it that many of our appliances - music systems, televisions, computer monitors - misbehave during highly humid months? Different erratic behavior have different reasons or failure mechanisms behind them. But lets look at a particular phenomenon: you try to press some button on your TV, but the TV, instead of performing the function assigned to that button, carries out a different function. i.e. you press the program+ button, but instead of the channel changing, the volume increases. A microcontroller repeatedly reads the voltage appearing at one of its ADC channels. After filtering and debouncing the signal, the value read from the ADC channel can be used to decide which button was pressed. Such a topology is beneficial because a single pin is all that is required to read all the switches (as opposed to multiple pins being required when a matrix layout is used). Each switch shorts all the resistors below it - therefore different switches will cause a different voltage to appear at the ADC pin of the micrcontroller. The microcontroller would determine which switch was pressed by passing the ADC value through an if, if else, if else structure to determine what "voltage range" the value lies in. 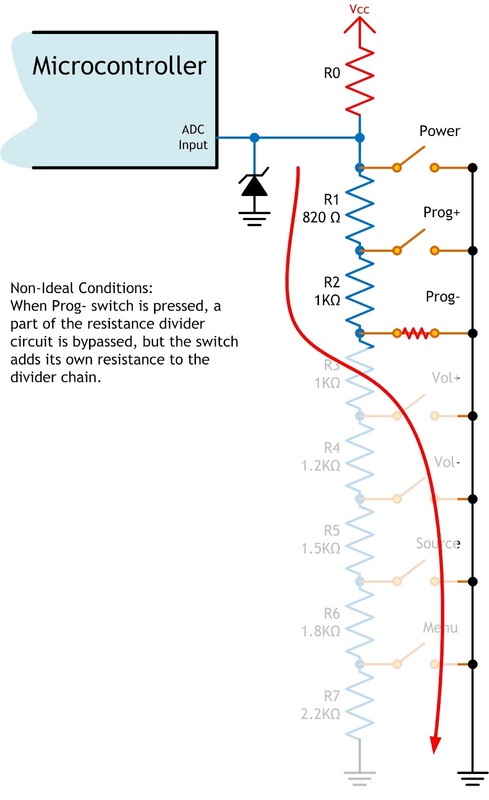 A unique feature of the circuit is that if someone tries to press two buttons, only that button which is physically placed higher in the chain (closer to the ADC pin as per the above schematic) will be detected - the priority is built into the hardware itself. 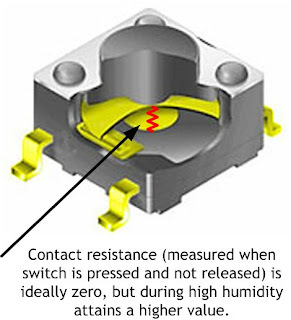 The reversed biased zener diode is intended to protect against ESD surges. Sony and Samsung are a few manufacturers which use this topology in their audio/video appliances. Like the "first robin of spring" my LCD computer monitor and LCD television 's misbehavior marks the beginning of monsoon. Original photo taken from here. 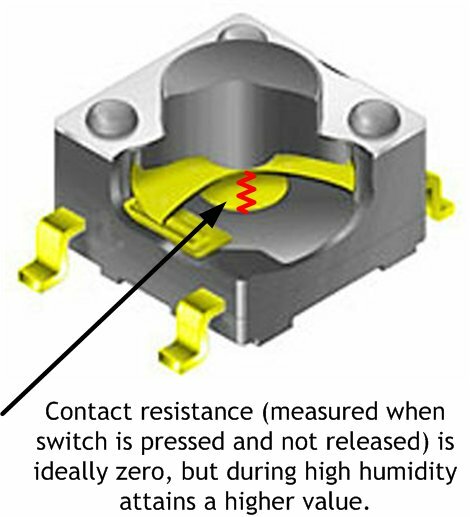 Comparing 3 types of tact switch - nice photos of internals of tactile switches with an alternate explanation of how they might fail. Connecting multiple tact switches on a single input pin of a microcontroller - alternate topology.